In 1835, the county commissioners of LaPorte County, Indiana, had jurisdiction of all land that comprises present day LaPorte, Porter, and Lake counties. In March of 1835, the LaPorte County commissioners, at the behest of the state legislature, ordered that three election districts be established west of the present day boundary between LaPorte and Porter counties. These election districts were named Waverly Township, Morgan Township, and Ross Township. Waverly Township comprised the northern one-half of present day Porter County, while Morgan Township covered the southern one-half. Ross Township represented all of present day Lake County. 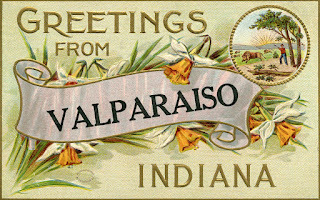 Greetings postcard from Valparaiso, Indiana. By an act of the Indiana General Assembly on January 28, 1836, it was decreed that on February 1, 1836, that Porter County would become an independent county to "enjoy and possess, all the rights, privileges, benefits and jurisdictions, which to separate or independent counties do or may properly belong." While Lake County was also laid out in this particular act, it was not until 1837 that the Indiana General Assembly enacted legislation to officially organize Lake County and grant it all the rights, privileges, benefits, and jurisdictions possessed by other counties within the state. When Porter County was officially recognized, Governor Noah Noble immediately commissioned Benjamin Saylor as Porter County Sheriff. Saylor was given the power to order an election for county commissioners and all other officers required to carry out the affairs of the newly created county. Therefore, an election was carried out on February 23, 1836, for the election of three county commissioners, one probate judge, two associate judges, a county clerk, and a county recorder. County, Indiana, from LaPorte County, passed on January 28, 1836. Source: Indiana General Assembly's Laws of a General Nature...., 1836. Noah Fouts, John Sefford, and Benjamin Nicholson Spencer were elected as commissioners of Porter County. Jesse Johnston secured the probate judge position, and James Blair and Lemuel G. Jackson were chosen as associate judges. Reverend Cyrus Spurlock, a Methodist minister, was elected county recorder, and George W. Turner became the first county clerk. The first meeting of the county commissioners took place on April 12, 1836, at the home of C. A. Ballard located in Portersville, with the commissioners first act being the establishment of ten townships. Ballard's home was located on the grounds of what was later referred to as the "old W. C. Talcott place." County, Indiana, from Porter County, passed on January 18, 1837. Source: Indiana General Assembly's Laws of a General Nature...., 1837. For the next 18 months, the commissioners of Porter County would conduct their meetings at the home of either C. A. Ballard or Jeremiah Hamell since a courthouse had yet to be built. In November 1837, the commissioners inspected and approved the first county courthouse that was constructed under the direction of Solomon Cheney. The structure was described as an "imposing affair of frame [construction], 20x48 feet." On June 7, 1836, the commissioners of Porter County met to select the county seat. Various historical records suggest that the county commissioners considered at least four sites to establish the county seat; these sites included Chiqua's Town, Porterville, Portersville, and the southeast shoreline along Flint Lake, commonly referred to as Flintville. Ultimately, Portersville was chosen, most likely due to its location and inducements offered by its promoters. Chiqua had at one time been an influential chief in his tribe, but a few years before the treaty of 1832 his love for 'fire-water' had led him to indulge in a protracted drunk, and while intoxicated his hut was destroyed by fire, his squaw losing her life in the flames. For his dissolute habits he was deprived of his chieftainship, but a few of his friends remained true to him, and these, seceding from the main body of the tribe, established the village under Chiqua's leadership. Seth Hull, one of Porter County's earliest settlers, established a homestead at Chiqua's Town upon his arrival in the late summer or early fall of 1833. Hull would later sell his claim to J. S. Wallace and move away. Native Americans and early white settlers lived together in and around Chiqua's Town until 1836 when the Native Americans were removed south to a location near the Kankakee River; they would remain there until 1842 when they were permanently removed from Indiana and relocated west of the Mississippi River. On November 11, 1856, Lyman Beach, Wilson Malone, and Thomas Pratt would record a plat at this site consisting of twelve lots and name their community Prattville. The community never grew to the extent that it would require a post office and had faded from existence by the early 1880s. William K. Talbot, an early Porter County pioneer, laid out a proposed townsite on his farm that was located about one and one-half mile southeast of Valparaiso, currently occupied by the St. Paul Catholic Cemetery along present day Sturdy Road (NE¼ of SW¼ of Section 30, Township 35 North, Range 5 West). A. G. Hardesty writes in his 1876 Illustrated Historical Atlas of Porter County, Indiana, that the town of Porterville existed two years prior to Valparaiso, but that it "handed in its checks soon after, as Valparaiso was taking the lead." It has been written that Porterville was also referred to as Talbot. William K. Talbot led an interesting life. He was a Presbyterian minister born in Athol, Worcester County, Massachusetts, on June 17, 1799, and he received an advanced education in divinity from Princeton University. He moved to LaPorte, LaPorte County, Indiana, from Parishville, St. Lawrence County, New York, in 1835. Talbot married Mary Prior on August 27, 1826, at Northfield, Franklin County, Massachusetts. When Mary passed away, he married Francina Ann McConnell on July 13, 1836, at Valparaiso. In 1840, Talbot removed to Andover, Henry County, Illinois, and later would become instrumental in the founding of the University of Iowa at Iowa City, Johnson County, Iowa; he would serve on this university's first Board of Regents in 1845. Talbot would also serve in the Civil War as a chaplain with the United States Volunteers Hospital Chaplains; he passed away on November 7, 1880, at Woodhull, Henry County, Illinois. Portersville, not to be confused with Talbot's Porterville, was the original name of Valparaiso. A group of citizens and investors that included Abraham A. Hall, James Franklin Doughty Lanier, James Laughlin, Benjamin McCarty, Enoch S. McCarty, John Saylor, John Crawford Walker, and William Walker formed the Portersville Land Company soon after the county's formation. Who were these men that founded the Portersville Land Company? It is speculated that James F. D. Lanier of Madison, Jefferson County, Indiana, provided the bulk of the financial backing for the company. He was likely to be quite influential from a political perspective as well. Lanier served as Clerk of the Indiana House of Representatives and assisted in the move of the state capitol from Corydon, in Harrison County, to Indianapolis. 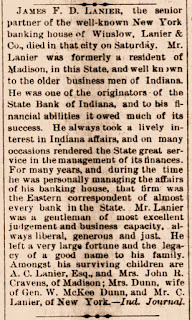 In 1833, he became the president of the Bank of Indiana. He would become extremely wealthy, with significant ownership interests in railroads, real estate, and pork packing houses. In 1851, Lanier would move to New York to start a bank with Robert H. Winslow named Winslow, Lanier & Company; he would remain in New York the remainder of his life, dying there on August 27, 1881. During the Civil War, at the request of Indiana Governor Oliver P. Morton, Lanier provided an unsecured loan of more than one million dollars to the state to keep it financially solvent. Indiana used these borrowed funds to service interest payments on its debt and to pay for the outfitting of Indiana's volunteer troops during the war. The state was able to repay the entire debt to Lanier by 1870. Notice concerning the death of James F. D. Lanier. Source: Indiana Herald, August 31, 1881. Like Lanier, Benjamin McCarty and his son, Enoch, were land speculators. They resided in Franklin County, Indiana, where they had considerable real estate holdings. Benjamin would make the first land entry in Franklin County in 1803, while Indiana was still a United States territory. Enoch was a delegate in 1816 to the Indiana State Constitutional Convention and a member of the Indiana State Senate (1832-1834). Enoch was serving as a member of the Indiana State House of Representatives (1835-1837) when the Portersville Land Company was formed. John C. Walker was a significant land speculator, as well as a transportation entrepreneur. At the time of his death in 1844, Walker was the largest private land owner in Indiana. He was instrumental in establishing four Indiana cities as county seats: Greensburg (Decatur County), LaPorte (LaPorte County), Shelbyville (Shelby County), and Valparaiso. Walker served as a member of the Indiana House of Representatives (1835-1836) and the Indiana State Senate (1836-1839). Between March 20 and August 10, 1837, Walker received a total of 26 grants of land in Porter County from the United States Government Land Office, representing more than 2,640 acres. Less is known of William Walker. It is known that William was residing in Union County, Indiana, at the time the Portersville Land Company was established, and had received five parcels comprising a total of 360 acres in Porter County through five land grants between March 30 and June 30, 1837. There is genealogical evidence to suggest that William Walker and John C. Walker were related, perhaps as first cousins. Little is also known of Abraham A. Hall (a few published histories refer to him as Abram). It is known that Hall owned a tavern in what would become Valparaiso that was called the American Eagle House. James Laughlin and John Saylor were residents of LaPorte County in the 1830s. When the Portersville Land Company was formed, Saylor owned 40 acres southwest of Valparaiso in Center Township (SW¼ of SW¼ of Section 27, Township 35 North, Rage 6 West), while Laughlin owned 160 acres in the northwestern portion of Washington Township (NW¼ of Section 4, Township 35 North, Range 5 West). Both Laughlin and Saylor received their land grants on March 30, 1837. The Portersville Land Company offered to donate an entire block to the county for the courthouse square, 96 lots, as well as provide an immediate donation of cash in the amount of $1,200 for the erection of public buildings. Special commissioners William L. Earl, a St. Joseph County resident, and Matthias Dawson and Judah Leaming, residents of LaPorte County, were appointed on January 28, 1836, to chose the location for the county seat; they met on June 7 and accepted the Portersville Land Company's offer on June 9. To guarantee payment of the $1,200 inducement, which was a considerable sum of money in frontier America in 1836, bonds were signed by Thomas Butler, Adam S. Campbell, George Cline, L. L. Hillis, James Hutchins, Benjamin McCarty, Enoch McCarty, Charles G. Minick, Isaac Morgan, George Z. Salyer, John Saylor, Ruel Starr, John Walker, and William Walker. On October 31, 1836, Benjamin McCarty platted his land, possibly purchased through financing provided by Lanier, in the southwest quarter of Section 24 in Center Township under the the name of the Portersville Land Company. On November 2, 1837, Lanier would receive ownership of land adjacent to Valparaiso from the United States government through a preemption claim assignment from Joel Martin, Junior. This 80 acres was the E½ of the SW¼ of Section 23, Township 35 North, Range 6 West (west of Sager's Lake and immediately south of U.S. Route 30). It is likely that Lanier was speculating that Valparaiso would grow rapidly, and presumably toward the south. It took only three years for the Portersville Land Company to sell every lot in town giving Lanier, the biggest investor, a healthy profit. Historical records strongly suggest that William K. Talbot's proposed village of Porterville was established prior the formation of the Portersville Land Company. It seems somewhat odd that the Portersville Land Company would appropriate essentially the same name used by Talbot for his village. Perhaps the name of Portersville was used by the land company to intentionally confuse future settlers? It is possible that the area was already being referred to as Portersville. Alternatively, pioneers residing in the area may have had a strong desire to use Porterville or Portersville as the name for the community to be centrally located in Porter County. Hence, Talbot and the Portersville Land Company may have merely succumbed to those naming desires. Flintville was a small community located along the southeast shoreline of Flint Lake in Center Township (Section 6, Township 35 North, Range 5 West). Though not officially platted into fifteen lots until 1875 by Daniel Wheeler, Daniel Goodman, and others, the general area was known as Flintville well before it was officially platted. The fifteen lots of Flintville straddled present day Calumet Road north of Burlington Beach Road. Goodspeed and Blanchard's 1882 history of Porter County states that "the Fletchers, of Indianapolis" promoted the Flint Lake site to be the county seat. 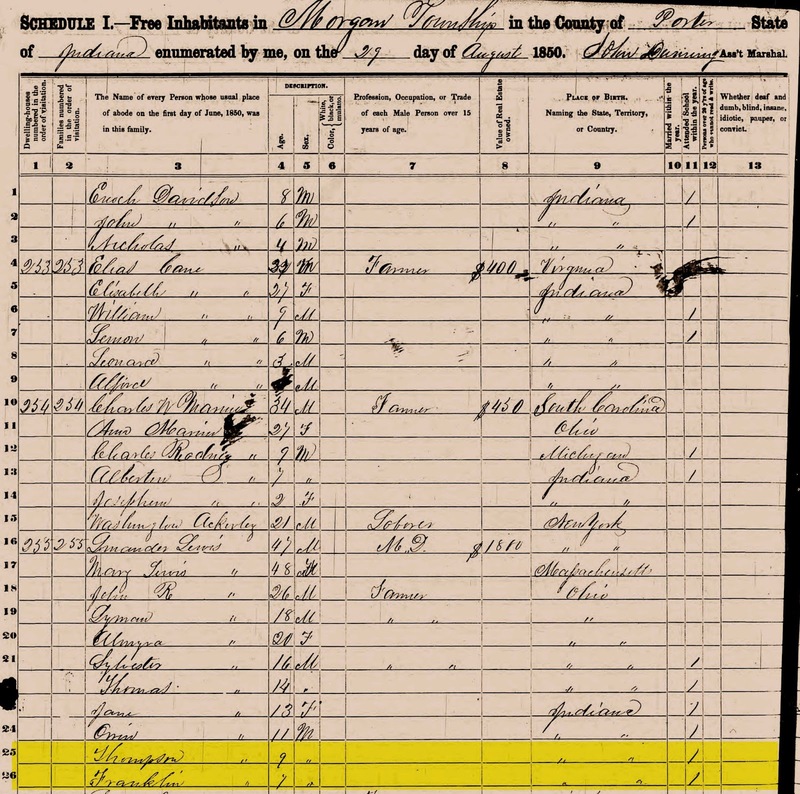 "The Fletchers" in all likelihood refers to Calvin Fletcher, an influential attorney, banker, landowner, speculator, and politician from Indianapolis between the 1820s and 1860s. Calvin Fletcher received seven grants of land in Porter County between March 20 and March 30, 1837, which included real estate in the townships of Center, Morgan, Portage (immediately east of Fillmore), and Washington. Three of these land grants included land embracing Flint Lake, as well as a portion of the lake itself. Had it not been for a party of wayfaring sailors, who dropped into its first hotel, Valparaiso might still, in this mid-twentieth century period, be known by its original name of Portersville. It was these sailors who, while visiting the American Eagle House in the winter of 1837-1838, suggested that the new county seat town be named after Valparaiso (from the Spanish, meaning 'Vale of Paradise'), Chili, where Commodore Porter battled with a large squadron of British ships. The American Eagle House stood at Franklin and Main streets and was first opened by Abraham Hall, pioneer settler. It is likely that the tale of the renaming was stated once and merely repeated until the basic elements of the story were considered fact. However, some of the "facts" of the story seem rather implausible, while others are outright incorrect. Where did the story of sailors visiting a tavern in Porter County first appear? The first three histories of Porter County, Indiana, published between 1876 and 1882, specifically mention the renaming of Valparaiso from Portersville. None of these three histories, however, provide any information concerning the motivation behind the name change. This seems to be a rather odd oversight given the romanticized tale of South Pacific sailors visiting the county and suggesting that the county seat should be renamed Valparaiso. southeast corner of the intersection of Lincolnway and Franklin Avenue. Source: Google Maps, October 2013. In the winter of 1837 a party of marines and sailors from the South Pacific ocean stopped one night at [Abraham A.] Hall's tavern [American Eagle House], where they were visited by a number of the citizens of the town. True to the sailor's instinct, these men loved "to spin a yarn," and until a late hour they regaled the townsmen with tales of the old Chilean seaport of Valparaiso and other South Pacific ports. Finally one of them suggested that as the county was named in honor of Commodore David Porter, whose famous battle while in command of the Essex was fought near the port of Valparaiso, Chile, it would be appropriate to name the county seat after that town. The suggestion was accepted and the name changed accordingly. Unfortunately, the 1912 history fails to provide any attribution to the events that took place 75 years earlier in Portersville. An extensive search of the four major historical newspaper archives failed to yield any information concerning sailors suggesting a renaming Valparaiso prior to 1912. 1912 History of Porter County, Indiana. 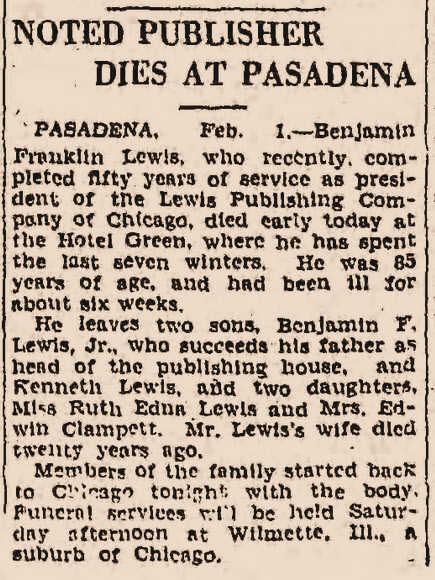 The Lewis Publishing Company of Chicago, founded by brothers Benjamin Franklin Lewis and Samuel Thompson Lewis, was a major publisher of subscription-based county histories during the late 1800s and early 1900s. Benjamin began his career working for the Appleton Company of Chicago by gathering historical recollections of small communities and selling subscriptions for the resulting published histories. Benjamin's older brother, Samuel, was employed by Charles C. Chapman and Company, a direct competitor of Appleton in the burgeoning market for published county histories. In 1880, the Lewis brothers left their respective employers and established the Inter-State Publishing Company, which focused almost exclusively on the publication of county histories, mostly concerning counties located in Midwestern states. For instance, they published the histories of at least fourteen counties in Indiana. They would later establish the Lewis Historical Publishing Company in New York, which focused on city and county histories in the eastern portion of the United States. Borrowing from local historians, editors compiled county histories that often included township sections or biographical accounts that came directly from popular yet untrained state historians.... County history publishers have left little, if any, evidence about where these standard histories come from, but they do not appear to have been penned in-house. What is particularly ironic about the Lewis Publishing Company's history of Porter County is the fact that the Lewis brothers were raised in the northern portion of Morgan Township in Porter County. Their father, L'Mander Lewis, a physician, owned 200 acres in Sections 4 and 5 of Morgan Township. L'Mander and his family had emigrated from Missouri to Porter County in 1849, settling on land on Morgan Prairie that was purchased from Asa Marine. L'Mander would eventually retire and move to Valparaiso, where he would pass way on September 3, 1880, the same year his sons formed the Lewis Publishing Company. Franklin Lewis in the household of L'Mander and Mary (Dodge) Lewis. It would be interesting to give specific record concerning each of the children of Dr. L'Mander Lewis and further to designate his descendants in succeeding generations, but such indulgence is not possible within the limitations of a review of this order, the publisher of this work feeling, however, that filial loyalty and affection should countenance and historical expediency justify the slight tribute here given to one of the sterling pioneers of Porter county. Given that Benjamin and Samuel Lewis spent their formative years in Porter County, and that both would have been familiar with and knowledgeable of the pioneers of the county, one is left wondering if they concocted the story of sailors at the American Eagle House promoting the name of Valparaiso? Alternatively, they may have simply wrote what a pioneer had told them when they were preparing the Porter County history and never verified whether the story was indeed true. 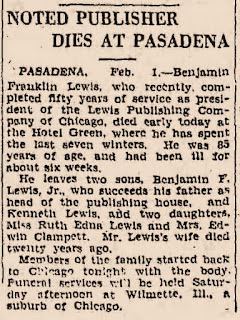 Death notice published for Benjamin Franklin Lewis. Source: The Los Angeles Times, February 2, 1928. By the 1930s, the story of sailors arriving at Portersville and suggesting a name change for the county seat had taken grip in newspaper columns. Valparaiso does not come into the picture until 1850, when by legislative act it became a village. From 1836 to 1850 this city was just a spot on the map, just like Salt Creek, Burdick, Jackson Center, or any other little settlements. In 1836 there was created this county and the seat of the county's business was fixed. It was Portersville to the wide world. Our research has failed to tell us when Portersville ceased to be, and when Valparaiso took its place. We would be thankful to any person who can supply us this missing information. 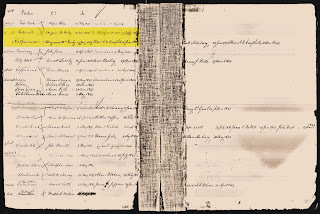 The following week, on January 26, Bowser published replies from subscribers L. Howerth Goetz and Henrietta Hanmer indicating that the village's name changed in 1837. Neither Goetz or Hanmer, however, mention the story of sailors. Some newspaper accounts indicate that a single sailor stopped for a stay at the American Eagle House, while the original account published in 1912 clearly states that "a party of marines and sailors" visited the Portersville tavern. One newspaper account, published in 1954 in The Anderson Herald, indicates that "An anonymous sailor, stopping overnight in a tavern, is credited with changing this city's name from Portersville around 1851." Perhaps The Anderson Herald was simply parroting what Arthur J. Bowser had published in 1935? According to local legend, "The story of how Valparaiso got its name was related to me this way. 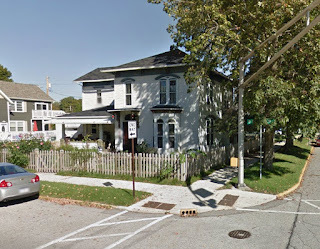 There were three sailors back in the 1800s; [they] were in this area, and they were at the point where the Northern Indiana Bank is now -- one of the geographical highest points in the area. And they could look over the whole countryside, and one remarked that it reminded him of Valparaiso, Chile, which means Valley of Paradise. According to the story, that's how Valparaiso got its name." 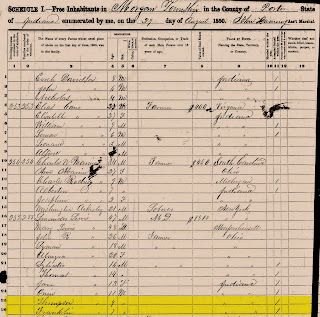 Why would sailors be traveling through Porter County in 1837? Only a handful of crude structures had been erected in the Portersville area at the time and growth at the new county seat was extremely slow. Also, the primary traveling route through Porter County during this period was near Lake Michigan; namely, the Chicago-Detroit Post Road. If sailors were merely passing through the county, it is more likely they would have traveled along the Lake Michigan route rather than using the Sauk Trail, which, according to contemporary reports, was a plain horse path that was a rather difficult trail to travel and required a guide for unfamiliar travelers due to the large number of side trails that branched off the main trail. Furthermore, why would the sailors remark that Portersville reminded them of Valparaiso, Chile? As mentioned in Baker's book, Portersville is not located in a valley. On the contrary, it is located on one of the highest points along the Valparaiso Moraine. Etymologically, the renaming of Portersville to Valparaiso makes absolutely no sense based on either visual appearance or physiographic description. The name "Portersville" was chosen as a catchy appelation [Sic]; but when it became important enough to have a post office, the leading minds of the town "waked up" to the fact that there was already an office by that name and it was against all rules and regulations to have to offices by the same name in the same state. It, therefore, became necessary to change the name and the town has, since 1837, been known as Valparaiso. This particular explanation for the name change is entirely correct. On November 29, 1821, a post office was established in Dubois County, Indiana, named Portersville, with Simon Morgan serving as the first postmaster for the first eight and one-half years. Portersville was the first county seat of Dubois County, established in 1818. This post office was discontinued December 31, 1909 due to a sharp decline in population. The Dubois County Portersville was reportedly named by pioneer Arthur Harbison, who "is said to have named the town in honor of some favorite relative." In 1830, the Dubois County seat was moved from Portersville to Jasper. It also true that the United States Post Office Department, later renamed the United States Postal Service, did not allow two post offices to exist within a state with the same name. on March 16, 1836, and the post office changing name on January 19, 1837. Microfilm Publication M841, Record Group 28. In a history of Valparaiso written in 1876 by Hubert M. Skinner under the nom de plume of A. citizen, it states that Portersville was changed to Valparaiso in 1837, but gave no further details. According to stories handed down it was said the reason for the change was due to the fact that another town by the name of Portersville existed in Dubois county, and Porter county people desired to avoid confusion. The name was changed to Valparaiso at the suggestion of a party of sailors who had returned from Valparaiso, Chili, and stopped here one night at Hall's tavern. 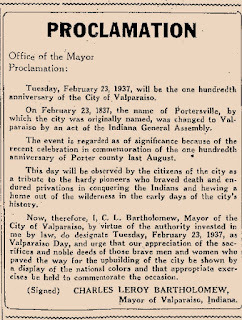 The legislative act which changed the town of Portersville to Valparaiso was passed on January 6, 1837. The plat of Portersville is dated July 7, 1836, and the plat was recorded October 31, 1836. There was an older Portersville in Indiana, the first county seat of Dubois County, located on the east branch of the White River. That town now has a population of about 200. To avoid confusion, the post office department ordered a change of name for the younger town. That was the reason, and the only one, why the name of the Porter County seat of government was changed to Valparaiso. The legislative act changing the name was passed January 6, 1837 to become effective at once with the understanding the change will not effect any contract. Neither the act itself nor the legislative journals give any reason for the change. On January 19, 1837, the United States Post Office Department issued an order changing the post office name to Valparaiso. It will be seen that the name of the local county seat was Portersville only from March, 1836, to January, 1837, a period of less than one year. Many stories have been told about this change of name but none can be true unless they antedate January, 1837. One story is that several sailors, who may have possibly seen service on the Essex [U.S.S. Essex] at Valparaiso [Chile], were traveling through and stopped overnight at the American Eagle House and hearing the discussion about names, suggested the name Valparaiso. The American Eagle House was situated on Lot 3, Block 22, Original Survey, at the southeast corner of Main and Franklin streets. This lot was deeded by [Benjamin] McCarty to Abraham Hall on May 5, 1837, the hotel was built in 1838 and not occupied until 39. That story, like many others, does not "hold water." Many, I know will be surprised to learn the name Portersville was used for this town for so short a time and also that most of the stories about the reason for change of name are without foundation. Mark L. Dickover was a noted Porter County historian and banker. 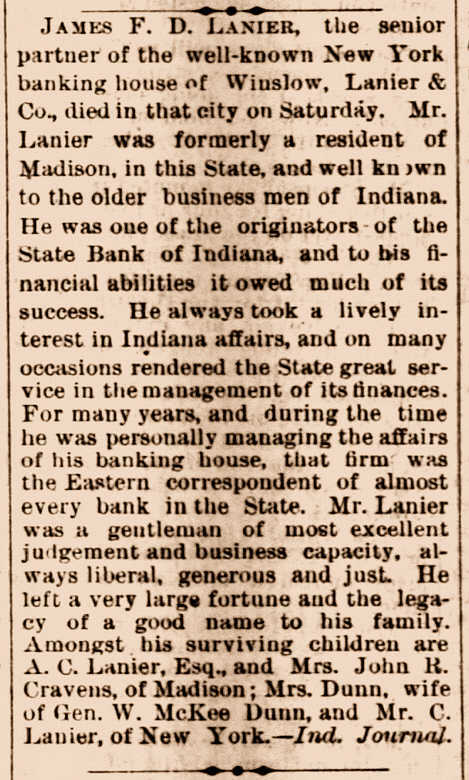 He entered the banking field in 1894 and was the Chairman of First Federal Savings and Loan in Valparaiso at the time of his death on June 1, 1962. Mark's father, Charles W. Dickover, served as Sheriff of Porter County from 1880 to 1884. Remarkably, despite Mark L. Dickover's clear and fact-based explanation of the naming of Valparaiso, the story of South Pacific sailors visiting the American Eagle House and suggesting the name Valparaiso continues to persist. Interestingly, though the county seat of Porter County was renamed Valparaiso by an act of the Indiana General Assembly on January 6, 1837, and became effective on February 23 of that year, the legal document recognizing the name change transferred from the state house at Indianapolis to Porter County was never officially recorded. While this may seem immaterial from a historical perspective, it had an impact on recorded property deeds that embraced the land within city boundaries. When the chain of title to properties were abstracted, many deeds indicated that the land being transferred was located in Portersville, not Valparaiso. Deeds containing Portersville as the location of a town created confusion among property abstractors and attorneys, and most individuals were unaware that Valparaiso was previously known, legally, as Portersville. William E. Pinney compiled one of the first complete sets of abstracts of property deeds in Porter County. Pinney sent inquiries to government officials at Indianapolis and Washington, D.C., in an attempt to determine why the name change was not recorded at Porter County. He was never provided an answer. Other attorneys in Porter County had also sought the legal details concerning the name change and had not been fruitful in their attempts. In 1935, E. W. Strecker moved from Crown Point in Lake County, Indiana, to Valparaiso. Strecker had purchased the property located at the northeast corner of Washington Street and Chicago Street. Strecker's Crown Point attorney was reportedly concerned that his client's abstract referred to Portersville, but contained no official record of a name change to Valparaiso. of Washington Street and Chicago Street in Valparaiso. Strecker informed The Vidette-Messenger about the Portersville-Valparaiso problem. Publisher Englebert Zimmerman, while searching for historical records at the Porter County Court House in 1936, discovered the legal document sent from the state house to the Porter County Clerk in February 1837 concerning the official name change of the county seat; the document simply had never been filed for recording and was left among a large pile of documents. Section 1. 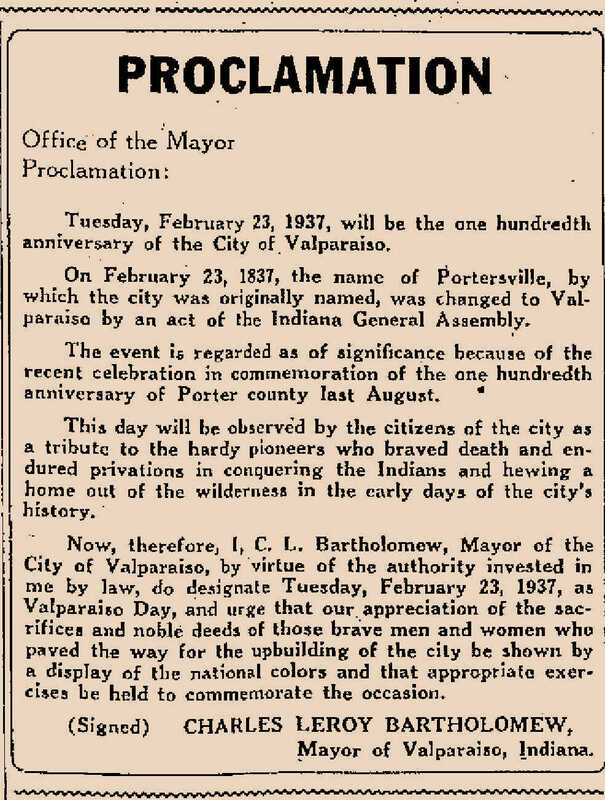 Be it enacted by the General Assembly of the State of Indiana, that the name of the Town of Portersville in the County of Porter, be and the same is hereby changed to that of Valparaiso. Provided, however, that such change shall not affect any contracts heretofore made on any public, or private rights. This act to take effect and be in force from and after its passage. Speaker of House of Representatives. I, William I. Brown, secretary of state aforesaid, do hereby certify that the foregoing is a true copy of the original acts on file in my office. Witness my and and the seal of state hereunto affixed at Indianapolis, this 23rd day of February, A. D., 1837. This day will be observed by the citizens of the city as a tribute to the hardy pioneers who braved death and endured privations in conquering the Indians and hewing a home out of the wilderness in the early days of the city's history. February 23, 1937, by Mayor Charles Leroy Bartholomew. Source: The Vidette-Messenger, February 22, 1937. Buss, James Joseph. 2011. Winning the West with Words: Language and Conquest in the Lower Great Lakes. Norman, Oklahoma: University of Oklahoma Press. 336 p.
Lewis Publishing Company. 1912. 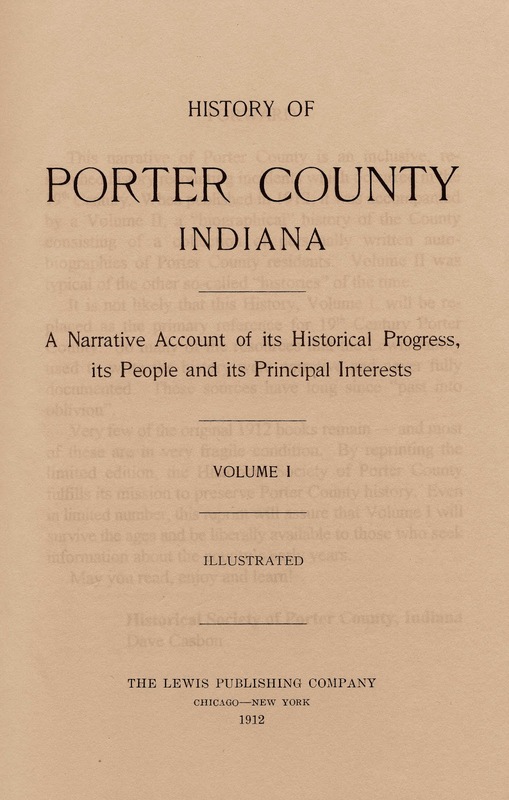 History of Porter County, Indiana: A Narrative of its Historical Progress, its People and its Principal Interests. Volume I. Chicago, Illinois: Lewis Publishing Company. 357 p. [see pp. 35-36, 138, 182, 191-215, 404-413]. Shults-Gay, Deborah H. 1923. One of the Earliest Authentic Histories of Porter County, Indiana, From 1832 to 1876. No location: Deborah H. Shults-Gay. Unpaginated. Skinner, Hubert M. 1878. 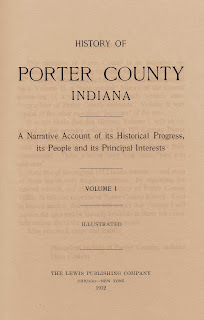 Complete History of Porter County, Indiana. Valparaiso, Indiana: Valparaiso Messenger [January 15]. The Valparaiso Bicentennial Committee. 1976. The Vale of Paradise, Valparaiso, Indiana: Photographic History of Valparaiso, Indiana, from the Turn of the Century. Valparaiso, Indiana: Boy-Conn Printers. Inc. 54 p.
Wolf, John D. 1999. With Captain David Porter or "How We Got Our Name:" Valparaiso & Porter County Indiana. Valparaiso, Indiana: Home Mountain Publishing Company. 10 p.
Shockley, Ernest V. 1914. County Seats and County Seat Wars in Indiana. Indiana Magazine of History 10(1):1-46. Porter County Vidette, Valparaiso, Porter County, Indiana; December 2, 1880; Volume 24, Number 49, Page 2, Column 5. Column titled "Death of Wm. K. Talbot." Indiana Herald, Huntington, Huntington County, Indiana; August 31, 1881, Volume 33, Number 50, Page 1, Column 3. The Chicago Daily Tribune, Chicago, Cook County, Illinois; January 20, 1916; Volume 75, Number 17, Page 15, Column 5. Column titled "Obituary. Samuel T. Lewis." The Los Angeles Times, Los Angeles, Los Angeles County, California; February 2, 1928; Volume 47, Number 61, Part II, Page 10, Column 6. Column titled "Noted Publisher Dies at Pasadena." The Vidette-Messenger, Valparaiso, Porter County, Indiana; February 4, 1928; Volume 1, Page 4, Column 6. Column titled "Services for B. F. Lewis, Sr."
The Vidette-Messenger, Valparaiso, Porter County, Indiana; March 8, 1928; Volume 1, Page 1, Column 1 and Page 4, Column 3. Column titled "County Soon to Pass 93 Year Marker," by Englebert Zimmerman. The Kokomo Tribune, Kokomo, Howard County, Indiana; October 13, 1930; Volume 48, Number 15, Page 13, Column 8. Column titled "Valparaiso." The Vidette-Messenger, Valparaiso, Porter County, Indiana; April 14, 1934; Volume 7, Page 1, Column 2 and Page 2, Columns 6-8. Column titled "500 Students Take Part in big Spectacle. 100-Year Pageant of Porter County, Written by Supt. Dinsmore, is Dramatize." The Vidette-Messenger, Valparaiso, Porter County, Indiana; January 8, 1935; Volume 8, Page 1, Columns 4-5 and Page 5, Columns 3-7. Column titled "Siftings Gleaned from Hither and Yon -- and Now and then -- and Way Back When," by A. J. Bowser. The Vidette-Messenger, Valparaiso, Porter County, Indiana; January 21, 1935; Volume 8, Page 1, Columns 4-5 and Page 5, Columns 3-5. Column titled "Siftings Gleaned from Hither and Yon -- and Now and then -- and Way Back When," by A. J. Bowser. The Vidette-Messenger, Valparaiso, Porter County, Indiana; January 26, 1935; Volume 8, Page 1, Columns 4-5 and Page 8, Columns 5-6. Column titled "Siftings Gleaned from Hither and Yon -- and Now and then -- and Way Back When," by A. J. Bowser. The Vidette-Messenger, Valparaiso, Porter County, Indiana; May 10, 1935; Volume 8, Page 1, Columns 4-5 and Page 6, Columns 4-5. Column titled "Siftings Gleaned from Hither and Yon -- and Now and then -- and Way Back When," by A. J. Bowser. The Vidette-Messenger, Valparaiso, Porter County, Indiana; July 29, 1935; Volume 9, Page 1, Columns 4-5. Column titled "City Once Bore the Name of Portersville But Abstracts Fail To Show Date Changed." The Vidette-Messenger, Valparaiso, Porter County, Indiana; August 13, 1935; Volume 9, Page 2, Column 6. 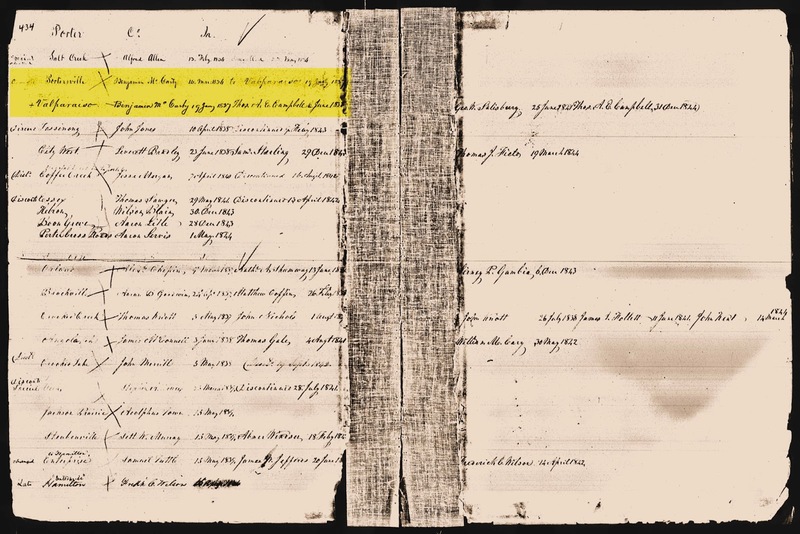 Column titled "Document Showing Name Change of Valparaiso Back In 1837 Now Is Recorded." The Vidette-Messenger, Valparaiso, Porter County, Indiana; August 15, 1935; Volume 9, Page 1, Columns 4-5. Column titled "Record Found of Change in Name of City." The Vidette-Messenger, Valparaiso, Porter County, Indiana; August 18, 1936; Volume 10, Section 13, Pages 8-9. Column titled "'Valparaiso is a Proud City,' Writes University Girl," by Mary Ellen LaRue. The Vidette-Messenger, Valparaiso, Porter County, Indiana; August 18, 1936; Volume 10, Section 3, Pages 7-9. Column titled "Grade Schools Write History of Center Township. Rural Schools and Teachers Compile Record of Events Since Coming of Pioneers." The Vidette-Messenger, Valparaiso, Porter County, Indiana; February 22, 1937; Volume 10, Page 1, Columns 2-3 and Page 2, Column 6. Column titled "Copy of Act of Assembly That Changed City's Name Never Recorded Until 1936." The Vidette-Messenger, Valparaiso, Porter County, Indiana; February 22, 1937; Volume 10, Page 1, Column 7 and Page 2, Column 2. Column titled "Here's Facts on How City Got Its Name." The Vidette-Messenger, Valparaiso, Porter County, Indiana; November 16, 1938; Volume 12, Page 2, Columns 4-5. Column titled "Kiwanis Hears Account of Early History, This Area." The Vidette-Messenger, Valparaiso, Porter County, Indiana; February 3, 1947; Volume 20, Number 179, Page 1, Column 7 and Page 2, Column 3. Column titled "Cites Record To Disprove Baldwin Tale," by Mark L. Dickover. The Vidette-Messenger, Valparaiso, Porter County, Indiana; May 15, 1950; Volume 23, Number 266, Page 6, Columns 1-2. Column titled "Local History Related By Speaker, Women Voters." Anderson Daily Bulletin, Anderson, Madison County, Indiana; January 21, 1954; Volume 69, Number 262, Page 4, Column 3. Column titled "How Another Town Came By It's [Sic] Name." The Anderson Herald, Anderson, Madison County, Indiana; February 13, 1954; Volume 86, Number 206, Page 4, Column 6. Column titled "Call All Hoosier Cities." Seymour Daily Tribune, Seymour, Jackson County, Indiana; April 19, 1954; Volume 72, Number 93, Page 9, Column 4. Column titled "Hoosier History." The Vidette-Messenger, Valparaiso, Porter County, Indiana; June 1, 1962; Volume 35, Number 280, Page 1, Column 7 and Page 6, Column 6. Column titled "Mark Dickover Dies At Age 92. Noted Banker Well Regarded in Community," by Rollie Bernhart. The Vidette-Messenger, Valparaiso, Porter County, Indiana; June 4, 1962; Volume 35, Number 282, Page 4, Column 1. Column titled "He Will Be Missed." The Vidette-Messenger, Valparaiso, Porter County, Indiana; October 11, 1966; Valparaiso Centennial Edition, Volume 40, Number 84, Section 2, Page 9, Columns 1-5. Column titled "Joseph Bailly, French Trader, First White Settler In Porter County Area." Excellent research and post, Steve! I've also been suspicious of the sailor story, for the same reasons. 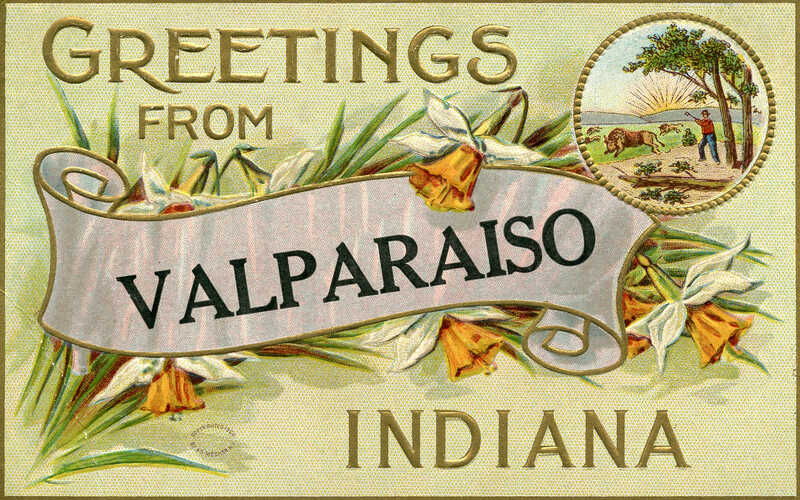 The Valparaiso City website continues to propagate the story at https://www.ci.valparaiso.in.us/283/History-of-Valparaiso. BTW, L'Mander Lewis is my 3rd great-grandfather! Thanks for the kind remark, Jon. The sailor story crops up all over the place, but not until after 1912. The Valparaiso City Website mentions that Hubert M. Skinner related the story of the sailors; that is untrue, unless Skinner wrote a history that is not publicly available. Skinner's major work was his 1878 history of Porter County. He mentions the name change, but nothing about sailors or any other motivation for the name change. Here's what Skinner wrote: "In 1837 the name of the county seat was changed form Portersville to Valparaiso. The county being named for Admiral Porter, the town was named for the scene of his celebrated naval battle – The Chilean Valparaiso." Proud Heritage;Prominent Future. Enjoy your work.